Kids have an amazing sense of creativity, and it's something we all have—until adulthood happens and most of us start to forget or neglect this side of us. Luckily for 6-year-old Dom, he has a dad who not only supports and encourages his wide-eyed imagination and creativity, but also helps bring his creations to life. 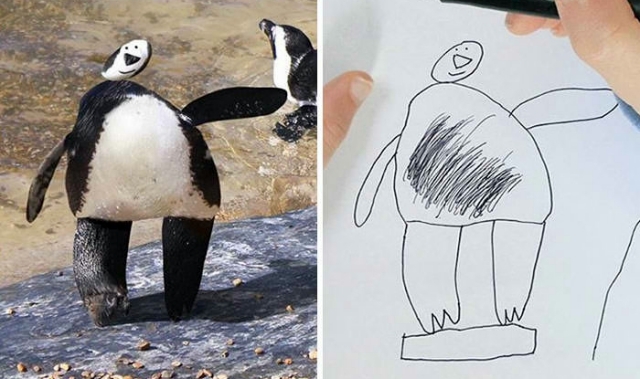 From boats and airplanes to odd-looking animals, this awesome Dad shows Dom (and everyone!) how Dom's drawings would look if they existed in real life. Here are just seven of the funny, adorable, sometimes creepy, definitely creative doodles Dom made and how his dad brought these creative drawings to life. Dom has an Instagram account where he documents and posts his drawings (his brother Al now draws and contributes too!) and how his dad turns them to reality. Check them out here!